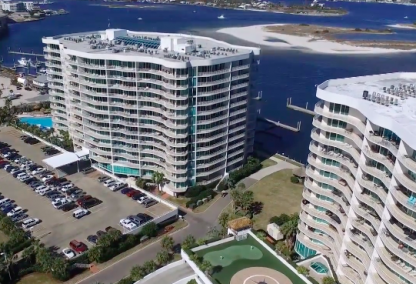 View Square Footage & Price Averages or find recent SOLD info, revenues, aerial imagery and more useful info on our Orange Beach condos for sale page. The intracoastal canal runs parallel to the Gulf of Mexico and offers numerous protected entrances to the coves and inland areas that comprise the Gulf Coast's shores. The most noticeable condo on this canal in Orange Beach, is the Wharf. Along with the Wharf is numerous other smaller townhome-style beach houses and smaller condos. ReadCaribe Resort is a popular family-friendly condominium in Orange Beach. Caribe offers wonderful amenities for everyone including a lazy river, indoor and outdoor pools with slides, kiddie pool, hot tubs, putting green, and tennis courts. These well-appointed condos boast floor-to-ceiling windows and wraparound balconies with fantastic views of the Gulf, Perdido Pass, or Old River. Owners and guests have access to a private marina with rental slips and Cobalt Restaurant located next door.